Important! HSCTI sells the Chi Generators® and other devices exclusively for research. After extensive research and many positive results, some academic scientists have already acknowledged radionics and yet some didn’t. Therefore, acceptance of these concepts and the effectiveness of radionics devices is my personal decision. All references to radionics, life force, etc., in our brochures reflect opinions of users of the devices from HSCTI, not the manufacturer. These devices have no therapeutic value at all and should never be used for such purposes. The use of the devices is the full responsibility of the purchaser. I have read and I understand this disclaimer. Delivery Time: We mail the merchandise within seven working days after we received payment or after the check has cleared. Usually 1 - 2 days after payment. Outside US: Add $70.00 per generator or kit for express mail delivery, $50.00 for priority mail, $30.00 for first class mail. Important Note: Phone Number must be Included if Outside US. Be sure to add cost of shipping..
All contents Copyright © 1995 by HSCTI Inc. unless otherwise specified. All information received from this computer system is protected under international copyright law. All other copyright notices apply to their respective holders. H.S.C.T.I., Inc. disclaims all responsibility for any damages resulting from the use of information transmitted to or from this computer system. The Terms "Welz Chi Generator®," "Chi Generator®," "Orgonite®" and "Orgone Generator®" are registered trademarks of Hyper Space Communications and Technologies International. Patents Pending. Frequency 7.83 Hz - In minutes you can now enjoy the benefits of living water (water in its original state) that is also super charged with life energy. Middle of the Line power. Use with methods of ADM (Astro Dynamic Manifestation) and to custom-design the Feng Shui energies of your choice. Top of the Line Chi Generator®. The LPOG 2400 HD is a Living Water Aqua Optimizer - like the CE 69, CE 99 and AO 2000, and it is a lot stronger. Its power is middle of the Line, comparable to the LPOG 2400 DL and it has a built-in frequency meter. Naturally you can also use it for any combination of these methods. Like all of our Orgone Generators®, which are middle of the line and above, it is a great device to optimize water. You can attach transfers onto your water line, onto dispensers, water tanks of reverse osmosis systems, etc. Top of the Line Chi Generator®, specially designed for persons who are involved in sports, body building, weight loss and Fitness Programs. Twelve precise settings to accomodate their requirements. Free Transfer Couple included. Free AC-DC converter (9V DC - USA only). Size: ca. 12.5 x 10.25 x 3.25 in. Donut-shaped Chi generator®, specifically designed for the RI 2400 CD Manifestation Program for PC. The five output pipes point to the center. Their frequency settings can also be used as radionics settings. The RAD 5 is a Living Water Aqua Optimizer. Free Transfer Couple included. By far the most versatile and powerful work station for trend management, treat and enhance 12 fields of life experience simultaneously or use for 12 different actions at the same time. It works well with the RI 2400 CD manifestation program. TNaturally, the frequency settings can also be used as radionics settings. Transfer Bar: ca. 1.8 x 0.8 x 0.3 inches. The transfer couple acts also boosts a bit the output power of the standard devices such as devices of the JU series. A good method is to attach one of the transfers onto a key ring or key chain while the other part is with your Chi Generator®. There is no need to take your AO 2000, CE 69 or any other water optimizer with you - Put water onto the larger coaster part and you will have living water within minutes - anywhere on the planet! Of course you can use it as well for food, drinks, supplements or cosmetics. Power Booster: ca. 2.8 x 2.2 x 1 inches. Silver Tubing. with the Alphabet of Success, represented in ikons. 5-position program. Structural Link to your Chi Generator® or Chi-Card® included. Selection of Background images. 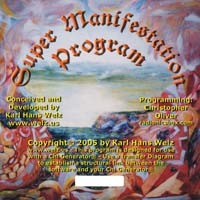 The Super Manifestation Program - $499.00 The most advanced of all manifestation programs, which allows you to set up any one of the previous programs, and then some ... You can install and run up to 22 positions each one with its own sound frequency. More than 1,500 filter symbols and many backgrounds and sounds to choose from. Structural Link to your Chi Generator® or Chi-Card® included. up to 3 positions - for PC or Mac - with 50 cards of the alphabet of success. Install backgrounds such as floor plans. With sound frequencies for each position. Structural Link to your Chi Generator® or Chi-Card® included. 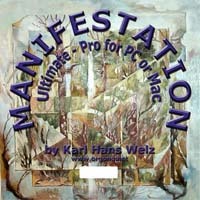 up to 45 positions - for PC or Mac - with 200 cards of the alphabet of success, and hundreds of other symbol cards. Install backgrounds such as floor plans. With sound frequencies for each position. Structural Link to your Chi Generator® or Chi-Card® included - naturally works also well for feng shui, as "astrological grrenhouse" - for sports teams and more. © 1996, 2008 Hyper Space Communications & Technologies Inc.